Clematis House est une maison de quatre chambres moderne proche de Halls lacunes canton. Cette maison offre des vues pittoresques sur les montagnes qui entourent Halls Gap. Nous offrons un hébergement très abordable pour un maximum de deux familles ou trois couples. Faites un tour de 2 km à vélo dans le centre-ville ou une courte promenade à l'hôtel local. Détendez-vous sur la belle clématite Chutes randonnée ou tout simplement se détendre et regarder la faune indigène venir directement à votre porte. Profitez également de la cheminée à bois qui est parfait pour la vie d'hiver confortable. Contient deux lits Queen, un lit double, un lit King simple et un lit superposé simple. Deux porte-lits sont également disponibles. In all my travels I have never experienced such a complete rental home. In fact we started to play a game to see if there was some common thing that was not in this comfortable house. There were no lobster claw forks but as we didn't have any lobster it was a mute point. The house is clean and airy. Plenty of space for the kids to play in the Yellow House avec un bac à sable and if you feel fit and healthy there are bikes supplied for the short ride into town or the even shorter ride to the local pub. If stay at home is your choice then there are plenty of books, games and TV. Or maybe a slow glass of local wine on the comfortable front, or back, verandahs is the go. Linen and towels are high quality and yes they have a tub of "old" towels to wipe up any mess on the floor. The bathroom, unfortunately no en-suite, is large enough for partners and kids to share. There is a separate loo. The view is wonderful like all of Halls Gap and yes you can see the pub. This is where we come to Eric. It is hard to ignore a handsome emu when you are sitting at the breakfast table and he looks through the front doors with a definite"Where's mine" look. I will say no more as there are restrictions in Halls Gap about feeding any of the native animals. Now in the pursuit of a balanced report I do have to raise that there is a major complaint. We found that the coffee cups were just that - cups! We all developed a craving for a decent sized MUG of coffee. I do hope this is remedied before we return for another visit. Second time we’ve stayed and love it, wrap round balcony, roos in the front garden, cockatoos all around - great house, lovely bath, comfortable bed - can’t wait to go back. Host is also lovely! Suitable place for a family getaway. It was a wonderful experience to stay in this home, specially for the kids. They enjoyed the moment related to home entertainment they had in the house. 2018 Christmas at Halls Gap. Fantastic, loved the house, lovely and clean. 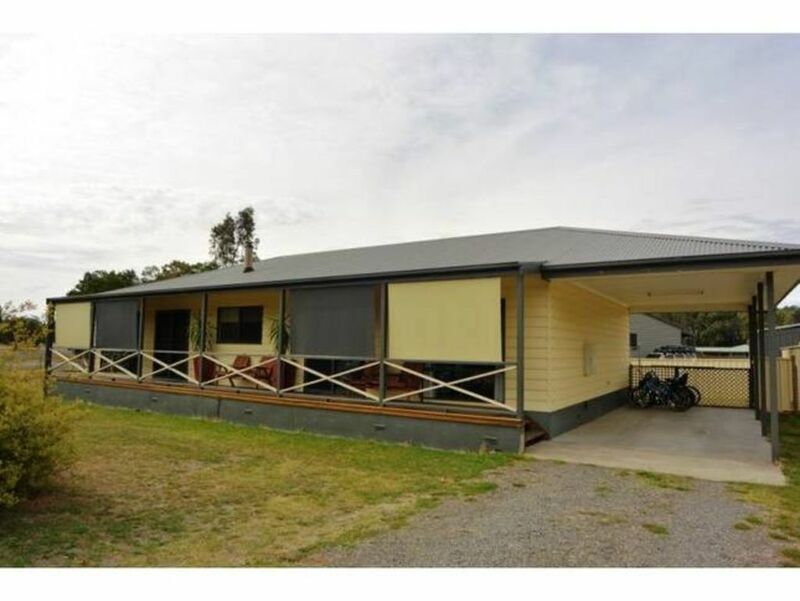 Very Clean, plenty of room - in kitchen, lounge and bedrooms, had everything you need, great outdoor area - with bbq, table and chairs and enclosed yard with cubby house, sand pit and toys. Love people to talk with. We stayed at Clematis House with our extended family and had a lovely holiday. It's a great set up for a family or small group, with 4 bedrooms, including 2 x queen beds and a double, plus singles. There are plenty of games for the kids and the property is safely fenced for small children. Our dog also enjoyed herself, thank you. Kangaroos and emus regularly come down to the paddock opposite and even into the street. Cockies come to the veranda looking to be fed. We're sure one even said hello to us. It's just down the road from the hotel and a 2 min drive to town. Thanks again. Great house in a great location. Had everything we needed and more.Very comfortable and lots of room for a large family. Will definitely go back.